Task-specific dystonia is a form of isolated focal dystonia with the peculiarity of being displayed only during performance of a specific skilled motor task. This distinctive feature makes task-specific dystonia a particularly mysterious and fascinating neurological condition. In this review, we cover phenomenology and its increasingly broad-spectrum risk factors for the disease, critically review pathophysiological theories and evaluate current therapeutic options. We conclude by highlighting the unique features of task-specific dystonia within the wider concept of dystonia. We emphasise the central contribution of environmental risk factors, and propose a model by which these triggers may impact on the motor control of skilled movement. By viewing task-specific dystonia through this new lens which considers the disorder a modifiable disorder of motor control, we are optimistic that research will yield novel therapeutic avenues for this highly motivated group of patients. The definition of task-specific dystonia is not straightforward. Current definitions, for example: ‘a collection of movement disorders that present with persistent muscular incoordination or loss of motor control during skilled movement’,2 are not as specific as they may first appear. At what point does a ‘loss of motor control’ become dystonia (an abnormality of posture), and does it indeed matter? Patients with task-specific movement impairment may not have obvious abnormal postures, but may instead have interruption to movement flow and sudden ‘blocks’ in movement production. Others have tremor with or without additional abnormal posture. Should these impairments all be lumped together (as they often are currently) or should they be split? Within the diagnostic framework for the dystonias as a group (which was revised in 2013) task-specific dystonias are considered a focal isolated dystonia (the term primary dystonia is no longer used3), but this categorisation fails to capture the essential task-specificity of the disorder. This discussion provides some explanation for why there is lack of consensus on the full range of disorders that should be included within the definition of task-specific dystonia. Most would allow incorporation of task-specific dystonias of the lower limb4 (such as the movement disorder of the foot seen in flamenco dancers5). Whether the movement disorders experienced by sportspeople, such as the transient spasms and jerks of golfers attempting to putt (‘golfers yips’) are a true task-specific dystonia is more contentious.6 An inclusive definition is probably beneficial, as there are common themes in phenomenology, and treatment strategies are arguably richer with a broader approach. As such, it would be reasonable that a broad definition of task-specific dystonia includes loss of motor control confined to a specific motor skill. This could include tremor and be with or without an evident abnormal posture. Musicians’ dystonia. Both musicians have a similar disability despite playing different instruments. The little finger of the affected hand uncontrollably curls while they are playing, impeding performance. The range of motor impairments seen in performing artists are varied, and a subclassification in musicians has recently been proposed2 which may have utility for classification of other types of task-specific dystonia (table 1).2 Within this classification, overuse syndromes are perhaps the most difficult to distinguish from task-specific dystonia. Both result in an impairment of motor function after repetitive task performance. Classically overuse syndromes are painful, whereas dystonia is not, and symptoms often generalise to all movements of the hand, not just a specific skilled movement. Stratification of risk factors has mostly been systematically studied in musicians’ dystonia, due to the existence of specialist clinics with large numbers of patients and good availability of control musician data. Most of the identified risk factors in this specialist group have also been reported anecdotally in other types of task-specific dystonia, but there is a relative paucity of case-controlled studies. An influence of genetic risk factors is suggested by the preponderance for males to develop task-specific dystonia (4M:1F in musicians’ dystonia20), and a positive family history of task-specific dystonia in a proportion of cases.21 A multicentre genome-wide association study has identified arlysulfatase G as a locus which may confer risk for task-specific dystonia of the hand22 (although independent confirmations are still needed to validate this result). One needs to be cautious about causality in this situation, as, though the genetic makeup of the individual may confer susceptibility to dystonia, it will also, in part, define the motor ability and aptitudes necessary for specific features of the affected task (such as the unique audiomotor interactions required for learning and performing music). Environmental risk factors really segregate task-specific dystonia from the other dystonias. The specific demands of the tasks, the parameters of task reproduction and non-task-related factors can all impact on motor physiology. It seems that the greater the departure of the task from the inherent ability of the limb, the greater the risk of developing dystonia. This influence of task ‘difficulty’ is exemplified by dystonias in performing artists or competitive sports in which the body is pushed to the very extremes of its spatiotemporal capacity. 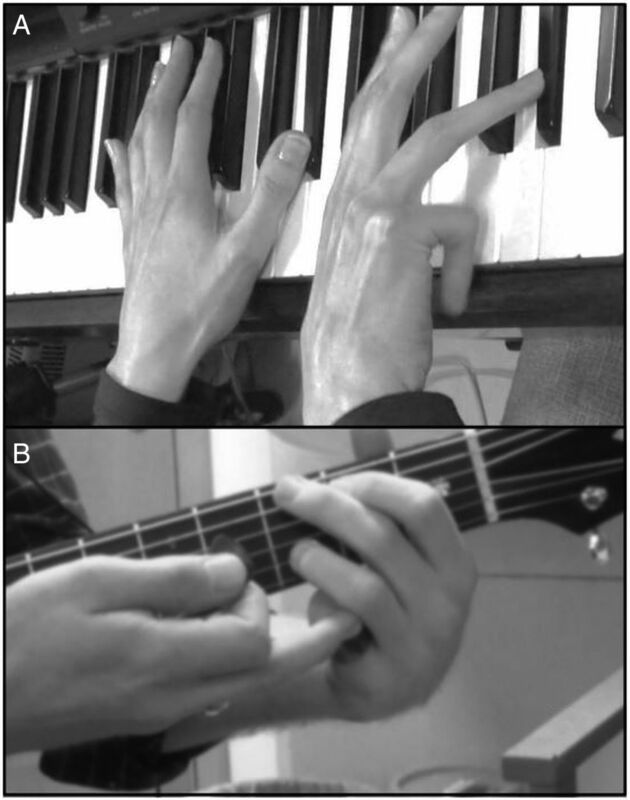 The probability of developing musicians’ dystonia depends on the instrument played (guitarists and pianists have the highest risk of developing dystonia), and dystonia preferentially involves the hand engaged in the more complex motor task. For example the right hand is more commonly involved in keyboard players where this hand typically carries the greater technical burden. The converse is seen in bowed instruments where the left hand carries the greatest technical demand as it demarcates the notes on the finger board. Any shift of the motor task ‘parameters’ also seems to endow risk. For example, in the 19th century, a change to steel nibs in clerks increased the force required for writing and led to a relative epidemic of writing dystonia.9 Similarly, we have seen dystonia precipitated by the need to switch to performing on an electronic keyboard with higher force thresholds than the piano. Changes in spatial parameters of the task may also be important; we have observed dystonia precipitated in a policeman who was required to document incidents within the small lines of his notebook, and in a musician who was asked to play the banjo (smaller) at the same time as the classical guitar. In a similar vein, musicians may develop dystonia shortly after trying to change a well-learned technique, for example, the manner in which the bow is held or the angle at which the instrument is held. Another risk modifier is a ‘time factor’. The task affected by dystonia needs to be performed for a significant duration of time per day (or at least per week) as evidenced by the occurrence of dystonia in tasks concerned with occupation. Within this ‘workload’ requirement not only do the number of hours seem to be important but whether there are any breaks in activity.9 Dystonia typically appears after the task has been performed for many years. What this signifies is uncertain. Perhaps certain risk factors have to be accrued over time, and only after a combination of ‘hits’ will dystonia start to develop. Alternatively, the age of presentation might reflect a time when the motor system needs to start to compensate for any age-related decline in function. Interestingly, musicians who start practising after the age of 10 years are at much higher risk of developing dystonia.2 In order to reach professional levels of skill performance, it may be a pre-requisite that training is initiated when the motor system is most adaptable during early childhood. So how do these genetic and environmental factors interact to cause the motor phenotype of dystonia? There are two dominant themes: impaired inhibition and abnormal plasticity regulation. We will briefly evaluate each of these pathophysiological theories in turn. The main problem with the inhibitory theory is that it is not a specific in finding task-specific dystonia and ‘reduced inhibition’ is seen in many other diseases. Furthermore, it is difficult to know if inhibitory changes drive dystonia, or whether they represent epiphenomenon collateral to the disease process. Variability of plasticity response in writing dystonia. Non-invasive stimulation is commonly used to assess levels of plasticity in the brains of patient groups. A popular hypothesis has been that plasticity responses are excessive and non-focal in dystonia. However, in healthy controls, the validity of non-invasive plasticity paradigms has been questioned.52–54 For example, it was previously thought a common plasticity protocol, paired associative stimulation (PAS), only evoked long-term potentiation (LTP)-like responses. However, when larger subject groups were examined, it was found that such protocols actually induce a range of responses in which both facilitation (LTP-like) and inhibition (long-term depression (LTD) like) are observed.53 Recent data suggests that such variability also exists in task-specific dystonia.56 This figure shows data from 15 participants with writing dystonia. Individual data points from the target muscle abductor pollicis brevis (APB) and the non-target muscle adductor digiti minimi (ADM) are plotted. Facilitation is defined by an increase in the size of mean motor evoked potential amplitude (MEP) at 30 minutes after the plasticity paradigm (positive values on the y-axis).Inhibitory responses are negative values due to a reduction in the size of mean MEP amplitude at 30 minutes. Similar to healthy subjects, a range of facilitatory and inhibitory plasticity values are seen, and minimal plasticity response is observed at the group level (shown by the solid line). Enhanced plasticity should, therefore, not be considered a dystonic fingerprint because the direction of plasticity response can vary, and there may be no systematic difference between plasticity responses in patients and healthy subjects. One possible consequence of abnormal plasticity regulation is that this could lead to a ‘merged’ sensory homunculus of the dystonic body part, such that, focal hand dystonia represents a condition in which the spatial distances between individual digits are diminished leading to coactivation of digits when only single digit action is desired. This idea was first substantiated using a primate model for repetitive strain injury and dystonia in which neuronal recordings in the primary sensory cortex demonstrated receptive fields that were 10–20 times larger than healthy monkeys.58 Subsequently, studies in patients with task-specific dystonia using both magnetic source and functional magnetic imaging techniques also suggested that finger representations in the primary somatosensory cortex were ‘closer to each other’ than in healthy subjects.59 ,60 However, it is now appreciated that the representations of individual digits in the motor and somatosensory cortex, in health, are highly overlapping.61 As such analysis of group data with traditional distance measures which calculate Euclidian distances between the points of highest activation for individual fingers, or a centre of gravity measures for individual finger may be ill equipped to explore the true organisational principles of cortical representations for individual fingers. Therefore, there is a growing evidence base to suggest that task-specific dystonia may not share core pathophysiological features which, traditionally, define other syndromes of dystonia. Furthermore, one would not predict that a disorder affecting a defined task would be caused by general changes in inhibition or plasticity. The clear influence of environmental risk factors and psychological factors suggest that a broader pathophysiological model may be relevant. A different approach would be to consider the pathophysiology of task-specific dystonia from the perspective of motor-skill learning, an area of neuroscience that has a significant theoretical and experimental foundation. This viewpoint allows us to propose that the whole range of motor dysfunction that occurs in a highly task-specific manner in those who intensely practice a particular skill may share at least some aspects of the same underlying pathophysiology. The fundamental feature of motor skill learning in health is that performance of a specific task improves with practice, to a point of relative stability of performance. Once this point has been reached, task performance is relatively resistant to decline, and performance of the task becomes largely automatic. The challenge in understanding the pathophysiology of task-specific dystonia is how a stable and highly practiced motor skill (and typically just a small part of it) can become degraded. The end result is a degraded neural network supporting the motor skill. This degraded network could be consolidated by continued unsuccessful attempts at task performance in the setting of excessive attention towards task production, and often mounting anxiety and stress due to the impact of the motor impairment. Although such a model of task-specific dystonia is predominantly theoretical, we believe it has utility for future research and management. Viewing the disorder through a motor learning lens may yield rehabilitative therapies which target the core drivers of the disorder, in contrast with existing medical management that is largely symptomatic. The management of task-specific dystonia should be coordinated within specialist movement disorder clinics whenever possible, as correct diagnosis and recovery necessitate a team that is well versed in the disorder, and is able to deliver the different facets of specialist therapy (many specialists are amateur artists themselves). There is an unfortunate scarcity of evidence to define an algorithm for treatment. This is, in part, due to the need to develop sensitive outcome scales/measures to enable the evaluation of different treatments. Currently, treatment is tailored to the individual depending on the expertise available. For example, within the National Health Service, rehabilitation expertise is very limited for this patient group, and thus, many physicians would advocate a single drug trial, and then electromyography-guided botulinum toxin injections for appropriate cases. Charitable trusts provide an important funding avenue for musicians to help musicians fund private therapy. Task-specific dystonia can seem, at first sight, a rather irrelevant disorder in the context of human health more widely. However, it nearly always impacts on the livelihood of the individual, and in performing artists or athletes their skill is likely to be intricately linked to their sense of self-worth and their professional and personal relationships.64 As such, it carries a very significant disability and impact. Oral medications rarely offer significant relief, often have dose-limiting side effects, and none have been fully assessed within a randomised controlled clinical trial. Anticholinergic medications, such as trihexyphenidyl, are the most commonly tried. Botulinum toxin injections aim to control excess activity in dystonic muscles, and the injection pattern is usually guided by electromyography. In writing dystonia and musicians’ dystonia a majority of patients report a positive initial response to therapy.65 ,66 However, a significant proportion discontinue therapy due to inadequate response,67 and this reflects our experience that the long-term utility of botulinum injections is often disappointing. This is particularly true in musicians, as the window between treatment efficacy and weakness that impairs function is particularly narrow. Stereotactic brain surgery and deep brain stimulation (thalamic) have been suggested for writing dystonia after claims of benefit in small non-randomised studies.68 ,69 These approaches should be considered highly experimental particularly while the pathophysiology is so poorly understood. We believe that there is a large potential for rehabilitative techniques to improve symptoms especially if the disorder is diagnosed early. However, the current state of the evidence is very poor, with no clear guidance on treatment selection, treatment intensity, outcome assessment and efficacy of current approaches. This makes it difficult to argue for expanded provision of such treatments for people with task-specific dystonia within public healthcare systems, even though some published data and our own experience is that such treatment can be highly beneficial in some patients. Learning from rehabilitation techniques in the sports sciences, as well as incorporating psychological approaches, will further equip rehabilitation strategies. This is a key area for research development. Task-specific dystonia has unique features within the wider concept of dystonia. We have highlighted the central contribution of environmental risk factors and how these features may impact on the physiology of normal control of skilled movement. Viewing task-specific dystonia through this new lens should provoke new research and therapeutic avenues for this highly motivated group of patients. Plato. Wordsworth Dictionary of Musical Quotations. 1991.
. Partial paralyses of the muscles of the extremities. London: Taylor and Francis, 1833.
. An Australian study of telegraphists’ cramp. Br J Ind Med 1971;28:280–5.
. Focal dystonia in musicians: phenomenology, pathophysiology, triggering factors, and treatment. Med Probl Perform Art 2010;25:3–9.
. Pathophysiology of dystonias. Adv Neurol 1983;39:851–63.
. Response variability to non-invasive brain stimulation protocols. Clin Neurophysiol 2015;126:2249–50.
. A primate model for studying focal dystonia and repetitive strain injury: effects on the primary somatosensory cortex. Phys Ther 1997;77:269–84.
. Anatomy of motor learning. I. Frontal cortex and attention to action. J Neurophysiol 1997;77:1313–24.
. Slow-down exercise for the treatment of focal hand dystonia in pianists. Med Probl Perform Artists 2006;21:25–8. Contributors AS wrote the first draft following conception of its design with ME. All coauthors then revised the manuscript in their key areas of expertise.